Heal & Strengthen your body with our help! Take care of yourself with regular chiropractic care. Visit us today to learn how we can help you! Call us today at (250) 390-2003! Located in north Nanaimo, Woodgrove Pines Clinic provides guidance and hands-on-care to enable its patients to recover from injuries and improve overall health and enjoyment of life. Dr. Stacey Scott and the staff at Woodgrove Pines Wellness Clinic have a genuine concern for your well-being and health! Call us today and we can develop a health care and wellness plan specific for you. Our clinic also treats sports injuries with Dr. Stacey Scott being deemed a sports specialist by the Canadian Chiropractic Association. Dr. Scott is not only board certified in sports injuries and rehabilitation, she was also a member of the Canadian Olympic Health Care Team during the 2010 Olympics in Vancouver/Whistler BC, which in her words was, "the experience of a lifetime! Additionally, Dr. Scott (our Nanaimo chiropractor) is an official SportHealth partner of PacificSport (Vancouver Island) in affiliation with world class, champion athletes! High Quality, Pharmaceutical Grade Supplements Now Available! If you are new to our website, please browse around to learn about our practice and to discover the wonders of chiropractic and wellness. 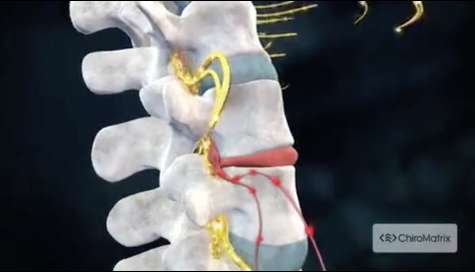 We hope you play the video (below), which is designed to help you learn more about the benefits of chiropractic health care. Also, click on the Email Us (bottom of page) to ask us a question or to send us feedback. 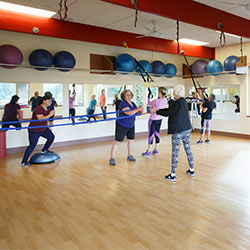 DID YOU KNOW our Health Club offers ICBC ACTIVE REHAB? Injured in a car accident? Our Kinesiologists can design a rehabilitative program to help you recover from your injuries. In fact, our Kinesiologists can help you with a rehabilitative program for almost any kind of injury, be it sports related or suffering from an accident at home. Call 250-933-3666 and let us help you recover! Now at Woodgrove Pines Clinic! 6 Weeks to a New You! Lose Weight Without Shakes or Pre-Packaged Food! As a ChiroTHIN Weight Loss patient you will experience fast, healthy weight loss without hunger or cravings. By following through with its revolutionary dietary and behavioral changes, and the ChiroTHIN nutritional support formula, your weight loss will be safe and affordable! Call 250-390-2003 to book your appointment today! Healthcare Program tabs here: Doctor Supervised Weight Loss Woodgrove Pines Wellness Clinic is a certified ChiroThin Weight Loss Center. Using this revolutionary nutritional support formula, many patients have experienced rapid weight loss without hunger, cravings or sacrificing their health. Come and let our doctors assess your current situation to determine if the ChiroThin supervised weight loss program is right for you. Please Welcome Dr. Kyle Salloum, Chiropractor to our Clinic! From his own experiences as an athlete, Dr. Salloum has always had an interest in sports injuries and general musculoskeletal complaints. Dr. Salloum is interested in chronic pain and pain pathology. and believes in the evidence based medicine model, which combines patient values, clinical experience, and the best available evidence to make decisions about patient care. Read more about Dr. Salloum HERE ! Please Welcome Suzy Moncz, Kinesiologist to our Clinic! Suzy believes in the benefits of exercise and an active lifestyle as an avenue to achieve and maintain optimal health and wellness, for all. Whether your goal is to improve your general health, optimize sport specific performance, or recover from injury, Suzy will utilize her skills, education and years of experience to guide you on your journey to recovery and achieving your potential! Read more about Suzy HERE ! Dr. Stacey Scott is a chiropractor and owner of a very successful private practice, which she founded in 1994 in Nanaimo, British Columbia. Dr. Scott graduated with both academic and clinical honours. Upon graduation she continued to study kinesiology, psychology, nutrition and sports nutrition. She also completed part one and part two of the American Team Physicians course. In 1996 she received her fellowship in Sports Injury and Rehabilitation*. This four year program deems her a sports specialist by the Canadian Chiropractic Association. In 2004 Dr. Scott became a certified provider of Active Release Therapy (A.R.T.). Dr. Derek Brown was born and raised in Nanaimo British Columbia where he participated in a wide range of youth sports including soccer, baseball, tennis, and hockey. His hockey career culminated with 3-years as starting goaltender for the Oceanside Generals Jr. B Hockey Club. Dr. Brown went on to spend 5-years studying Kinesiology between Vancouver Island University and the University of Victoria, and a further 4 years earning his Doctor of Chiropractic designation from the Canadian Memorial Chiropractic College. Dr. Erickson uses a patient centered evidence-based approach to chiropractic care, utilizing his skills in diagnosing, soft tissue work, manual adjusting, exercise prescription and sports performance to guide his scope of practice. A Board Certified Chiropractic Sports Physician (CCSP®) and receiving a Master’s in Sports and Exercise Science (MS), Dr. Erickson specializes in sports injuries and manages these conditions with a functional and sport/lifestyle specific approach to eliminate pain, improve performance and prevent re-injury. Dr. Erickson focuses his energy towards patients with active lifestyles, acute injuries, chronic injuries and over-use muscle pain and works on getting them back moving and doing the things they love. Dr. Gisella Ramon Brown is an enthusiast of learning, having graduated with distinction from the University of Victoria with an honours degree in Chemistry. During and after university, she worked for several years in chemical research at UVic as well as at Lifelabs Medical laboratories. After discovering the wonders of chiropractic through her own healing journey, she decided her true passion was not at a lab bench, but rather, helping heal others with her hands. Dr. Ben Clark was raised in the northern interior town of Prince George, British Columbia. As a kid you would have found him participating in sports such as youth hockey, soccer, and wrestling or in the mountains snowboarding. Dr. Kyle Salloum has always had an interest in sports injuries and general musculoskeletal complaints. During his internship at CMCC he also became interested in chronic pain and pain pathology. Dr. Salloum believes in the evidence based medicine model, which combines patient values, clinical experience, and the best available evidence to make decisions about patient care. He uses his knowledge of the human body in conjunction with manual medicine, joint manipulations and mobilizations, soft tissue therapies, postural and functional alterations (and a wide knowledge of exercises, nutrition, and supplementation), to help reduce pain, improve function and allow his patients to live their best quality of life. Dr. Stacey Neilson holds a Double Advanced Major in Biology & Neuroscience from Dalhousie University; as well, a Doctor of Naturopathic Medicine degree from the Canadian College of Naturopathic Medicine. 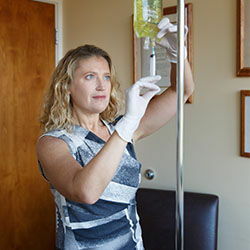 Dr. Neilson is certified in IV Therapy and Chelation Therapy, advanced injection therapies including Prolotherapy and PRP, Neural Therapy, Perineural Therapy and holds prescriptive authority in the province of BC. She has additional education and training in Naturopathic Supportive Cancer Care, and she is certified in Acupuncture. Dag was born in Bergen, Norway. He studied Physiotherapy in Aberdeen, Scotland, graduated in 1990 and became a member of the Chartered Society of Physiotherapy. Dag has acquired extensive experience in sports injuries, orthopaedic rehabilitation, neurological rehabilitation as well as manual therapy of the spine and extremities using various manual techniques. 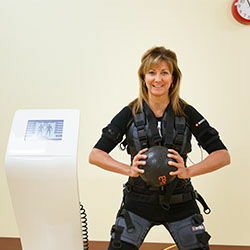 Cameal graduated from the University of Toronto in 2009, where she received her Masters of Science in Physical Therapy after completing an Honours Kinesiology Degree from McMaster University. She recently completed the Case Management certificate program from McMaster University that focused on coordinating client-centered care within health and social services. Lorraine Bruce graduated from the West Coast College of Massage therapy in Vancouver, B.C. in 1985, Vancouver's first accredited college in BC for massage therapy. 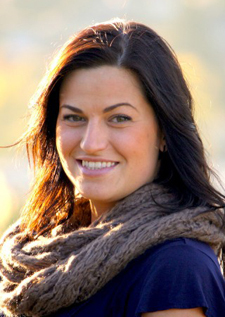 Meghan, originally from Osoyoos BC, is a 2012 graduate of the Canadian College of Massage and Hydrotherapy in Halifax NS. She first began practicing as an RMT in Alberta but recently moved to Vancouver Island and joined the team at Woodgrove Pines Clinic. Maria is a 2013 graduate of the 3000 hour program of the West Coast College of Massage Therapy. During her time at WCCMT she was fortunate enough to treat a wide variety of pathologies. Mike Joyce is a graduate of West Coast College of Massage Therapy (August 2014) in Victoria BC. Following graduation Mike moved to Parksville, BC at the beginning of 2015 after living in Victoria for the previous twelve years. Tom graduated from Vancouver College of Massage Therapy in 2016. He has been an avid rugby player for 12 years playing at top club level in BC. His experience in athletics went a long way in his understanding of the body, movement, and injury. He understands how posture and bio-mechanics can affect aches & pains, and their relation to pathology. Tammy Chater is a graduate of the four year program at The Canadian College of Acupuncture and Oriental Medicine in Victoria. Tammy is a licensed member of the self-regulatory body, the College of Traditional Chinese Medicine Practitioners and Acupuncturists of B.C. She will be pleased to outline the most effective treatment to help you meet your needs. 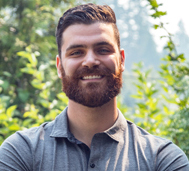 Cameron Wallace is a registered Acupuncturist with the College of Traditional Chinese Medicine Practitioners & Acupuncturists of British Columbia. He graduated from Reeves college in Edmonton AB, then transferred his registration back home to BC. Marie received her Bachelor of Human Kinetics majoring in Clinical Exercise Physiology at the University of British Columbia- Okanagan. During her undergrad experience, she had a keen interest in the clinical and research areas of her curriculum. Working along side members of the Centre for Heart, Lung, & Vascular Health, Marie analyzed how cardiovascular and pulmonary systems can be manipulated to optimally improve health in COPD patients. The staff are exemplary and amazing. You feel that you are part of the family. I have been in laser therapy for quite some time and feel like it’s improving and hopefully, completely gone. Dr. Ben (Clark) really assesses the patient, not like a bim bam boom thing. He really examines the patient and analyzes the best treatment for the patient. Staff are approachable and not intimidating. If I had known of the clinic a few years ago I would have definitely come here for treatment. What amazes me the most are the staff; they really feel you, what you are going through when it comes to pain. I would definitely recommend this amazing clinic! I’d like to share my amazing experience with Chirothin weight loss program. I am 60 years old and stand 5’6” tall. I began the chirothin program on May 15, 2018 (Size 16), weighing 217lbs. As of September 25, 2018, I am down to a size 8, weighing 159lbs --- that’s 58 lbs! Due to an accident (being struck while walking), and a thyroid condition, my extra weight made me feel embarrassed and depressed, along with having low energy. I became increasingly anti-social. But once I chose to embark on a lifestyle change, Marion at Woodgrove Pines Wellness Clinic helped me begin with their chirothin weight loss program. My journey back to health, strength and being whole again was underway. And now, 58 lbs later, I can honestly say that you should never give up! No matter what! With determination and work you can achieve your goals too! Call the clinic and ask for your free chirothin assessment with Marion. It might change your life! It has certainly changed mine. A note of thanks (for Mike). Nice (massage therapy) session... indeed drank lots of water. You really blasted things….BUT….no ill effects. Much appreciated. Been on “a table” a “few times” over the years…..and with experience, I can say you are a TRUE PROFESSIONAL at what you do !!! This year I have received several treatments from chiropractic, physiotherapy, rehab, and naturopathic care. Thank you so much for all the professional care. The clinic has a fantastic team working together to make sure all your medical healing needs are me. Greta job everyone, I love seeing the clinic growing in success as these types of services are needed, as it seems people will not slow down and learn to drive properly. I am very interested in the new gym downstairs and love the fact that it is 24 hours. Thank again for all the great service and care. P.S. The vitamins are great quality and a nice touch to be able to buy here. I first went to the clinic to see Mark Erickson – As I walked through the door I was greeted by a very happy bunch of gals at the front desk, even when they take your money, they are still happy. My first time with Mark was awesome. I have had lower back troubles all my life. Mark is now known to me as miracle Mark. He said I should have decompression which I had 4 times. To the gal’s in the (rack room) good sense of “ha ha” and answered all my questions as they pulled the tie down straps as hard as they can with a big smile on their faces. Mark told me I should get orthotics for my feet. Went to Harris orthotics at the clinic again an awesome experience. Mark said I should have deep muscle massage, so I went to Maria Kirkbride (Ouch) but it works and results have been again, awesome. Who ever set this clinic up gets a big pat on the back from me! I have never had such a good experience in my life from such a happy crew. Thank you. Dr. Brown has been my chiropractor for more than 5 years, for firm intense shoulder pain to spine, he always manages to find relief; if not immediately, he won’t stop until it’s 100% cured. I have referred a lot of my friends and bosses to Derek Brown because I trust him. After much hounding and nagging from my loved ones, customers, and coworkers – I decided to give Woodgrove Pines a try. 1st visit to book my appointment was the biggest challenge (I guess you can say I procrastinate when it comes to taking care of myself). 2nd visit, Dag (Ronhovde – Physio) gave me tools to be a stronger, better me. I’ll be back, teaching client’s how to better manage and use what our moms gave us – How can one deny such an offer? Thank you for giving me tools to live the best me. Friendly, professional and helpful staff at reception. All staff willingly answer questions and deal with concerns in a knowledgeable, supportive manner. Cameal (Sinclair – Physio) has a beautiful way of making patients feel comfortable and at ease. She explains what she is doing and why and addresses each concern/question thoroughly. Mike (Joyce-RMT) efficiently responds to my concerns and provides suggestions to help on my recovery. I have seen Dr. Gisella Ramon Brown and Dr. Mark Erickson and they have both been amazing in treating my back, neck, and fibula. I only need to see them occasionally now for maintenance. They are amazing and gifted at how they can manipulate the body and make it better. The staff are warm, friendly and very customer-service focused. Tammy, my acupuncturist is excellent, both in her acupuncture knowledge and training, and in her warm, caring attitude. Whenever I “tweak” my back Dr. Ramon-Brown is on my quick dial! Great service. Gisella’s (Ramon-Brown - Chiropractor) work and advice are exemplary! Through my many (3-4 years) of trusting her to treat and advise me I have found relief for extreme long term (before coming) shoulder pain from tears. The light laser treatment she recommended has helped with healing after a wrist breakage and shoulder condition! Staff is always sweet and personable. I love that Woodgrove Pines offers a wide range of care options – I regularly see a chiropractor, RMT and acupuncturist, and the ability to do it all in one place is fantastic. It makes getting to know my “team” so much easier, not to mention how much less complicated scheduling is! They’ve supported me through various athletic goals, injury recovery and pregnancy. I am thrilled with the service I receive on a (super) regular basis and would recommend Woodgrove Pines to anyone looking to enhance their health. Meghan Reid has been solely responsible for fixing my severe Achilles tendonitis. I suffered for 2 years despite other forms of treatment but am now pain free. Thanks Meghan. I would like to thank Mark (Erickson) and Mike (Joyce). Over the past few years I have struggled with back pain and a knee injury due to my active life style. Mark has gone above and beyond, he was able to recommend the treatment I needed along with chiro to get me where I am today. It’s more than just a business or job for Mark, he treats you like a close friend which is very comforting. Staff was amazing, this is going to be my fourth chiro/laser. I feel a lot better. My leg is starting to be normal again as I had a brutal tailbone injury. I am more comfortable sitting/standing. My injury is getting better daily. My mom referred me, as my father and herself both see Dr. Erickson too. I have had the opportunity to work with Dr. Stacey Scott. She not only listens to you…but gets results…unlike others in her field if you tell her it hurts she approaches from another angle… I especially am getting results from the combination of chiropractic and laser therapy. Thank you. Over the years this is the best chiropractic treatment I have had. It keeps me mobile. The staff are so nice and it is a pleasant experience to be here.